When you need immediate garage doors repair, you require fast intervention of the best technical crews in Ontario. This is natural since garage systems are extremely important for your safe access to the house and its security and for this reason Garage Doors Thornhill have created a great technical network of the best expert professionals, who can take care of any problem with great speed. We have the knowhow to provide exceptional services and the knowledge to answer your questions but we can also provide top repair parts and the best branded door panels. When services are delayed, problems get bigger and may have terrible consequences. We acknowledge the significance of incredible speed for broken spring repair and similar urgent services and that’s why we respond very fast to each call and keep our vans ready to rush off. Spring or cable problems will not only make the entire system dysfunctional but they will also compromise the security of your house in Thornhill and the safety of your family. That’s why we keep prepared and are perfectly trained for extension springs repair, Genie replacements or Chamberlain opener troubleshooting. Garage mechanisms age and eventually you will need to replace garage door panel sections or the whole door. This is the only way to ensure good home security and safety and we can offer our assistance when you are looking for a new door and for the technical work. You can actually find the most prominent branded door panels at our facilities and you can have our full support for its installation. We will offer consultation, check the existing system in case we need to make some repairs or replacements and we can stand by your side every step of the way. 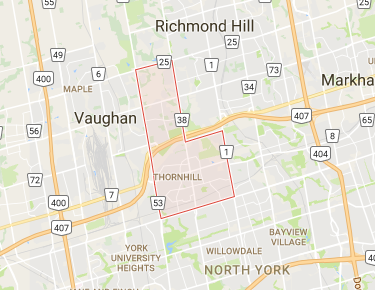 Garage Doors Thornhill is at your service for your occasional needs or for a 24 hour door off track repair.